Dykes ran 2:57:17 at Rotterdam in April. 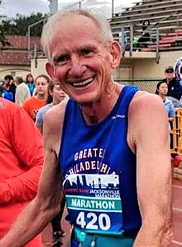 Last weekend in Jacksonville, FL, 70-year-old Gene Dykes, from Philadelphia, ran a 2:54:23 marathon--the fastest ever by a 70+ runner, breaking the mark of 2:54:48, held by the legendary Ed Whitlock. (Run when Whitlock was 73.) 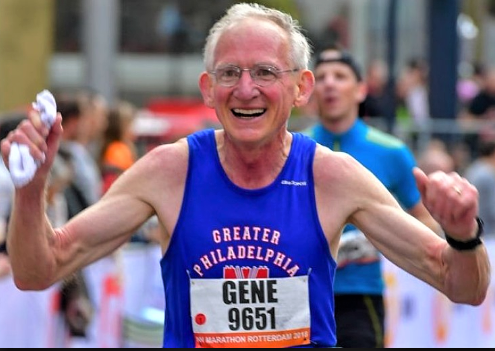 Dykes had run two previous sub-3:00s this year since he turned 70 in early April. Before 2018, his marathon PR was 3:04:27 in 2015. His Jacksonville performance may not count as an American age-group record, as the event was apparently unsanctioned by USATF. However, it was certified and met the other record-eligible standards. Here Dykes provides some of his background, and explains how he has run so fast this year. How did you run so much faster at 70 than at any earlier age? 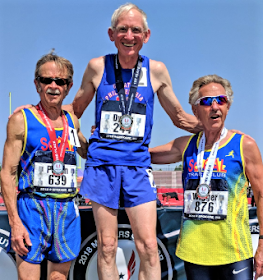 There are three key answers to that: Being an elite runner at a younger age appears to be one of the most accurate signs that you won’t be an elite at an older age. I was most definitely not an elite runner early on. My coach hated me when I totally stunk up the joint on the Lehigh University track team. Since I couldn’t cut it at the distance runs (880, mile, 2-mile), I taught myself triple jump and intermediate hurdles to become of value to the team. This experience gave me a long-lasting and deeply embedded belief that I was a mediocre runner at best. It’s still hard for me to believe that I’m doing so well. Instead of racing, I threw my energy into golf and bowling, where I enjoyed considerable success. I still liked running, though, so I was an occasional jogger after college. Sometimes in shape and sometimes not, but the important thing for my current career is that I wasn’t burning myself out racing. I ran my first marathon (NYC) in 2006 at the age of 58. For the next seven years, I gradually improved, lowering my PR from that initial 3:43 to a 3:16 at Steamtown. Not bad, of course, but nothing that was going to turn heads. My next PR attempt was at the Toronto Marathon and I was extremely disappointed with a 3:29. I figured I was finally succumbing to the ravages of old age, so in one last attempt to see how good I could be, I hired a coach. What a revelation! After just five months of his training, I ran a 3:09 at Boston, making the podium with a 3rd place finish in the M65 group. Each year since then, I’ve improved even more, and not only improved, I truly believe I’m improving more each year than I improved the year before. Just look at my marathon PR which went from 3:04 to 2:54. PR’s at all distances this year were big improvements. What could possibly be going on here? Lots of runners didn’t burn themselves out earlier and have hired coaches - why am I enjoying such singular success? Hand in hand with trying to improve my racing times each year, I also tried to outdo myself each year with running adventures. Starting with four and five day supported adventure runs, I moved on to six and eight day stage races. I started running the occasional 50K, and then 50-milers, and then 100-milers, 120-milers, and then a 200-miler. How do you top that? Last year I ran three 200-milers in three months. How am I going to top that next year? With just a week or two between races, I’m going to run two 50-milers, a 100-miler, and a 200-miler in January and February. That’s the start of my training for the Boston Marathon next year. I believe that running these huge ultras gives me the kind of strong base that can be leveraged into marathon speed with a little targeted training. 2:54:23 in Jacksonville last weekend. Breaking down the pieces: How did you train differently? What was your average mileage? What were key workouts that you focused on in each week? I really didn’t train any differently at all! My average mileage in a training week is usually 40-50 miles. Every week contains a couple recovery runs, a couple general aerobic runs, and some kind of faster workout, which my coach mixes up so much there is really nothing typical. 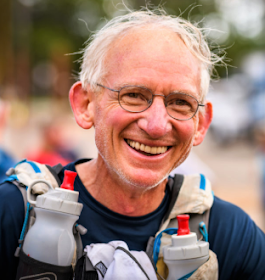 The only thing I did differently for Jacksonville than Rotterdam or Toronto was that I ran both a 50K trail race and the California International Marathon on consecutive days just two weeks beforehand. Not your typical prep for a world record attempt! Did you do any training you haven't done in the past, ie, strength training, hill bounding, yoga? Nope. No strength training, no cross training, no stretching… I just run! Did your weight or nutrition change in 2018? What's your height and weight, and typical diet? Between major races, my weight drifts up to about 142 or so on my 5’10”, but I always try to get under 140 for a race. Keeping my weight down is the hardest part of training! I did a miserable job of losing weight for Jacksonville, so with one week to go I lost five pounds in four days, and I probably gained back a pound in the three days before the race to weigh 138. Two seconds per pound per mile is a very compelling argument for weighing as little as possible. I think I could get into the lower 130’s before crossing the counterproductive threshold, but I enjoy eating too much. I’ll eat anything in moderation – no fat/carb/sugar/vegan restrictions. Diet for several days pre marathon? Normal diet until the night before a race. Then, I pick foods that I think are easily digested. Did you try any of the things people talk about these days--beets, low carb, ketones, caffeine? Nope, nope, nope, nope. at Outdoor Nationals last summer. Did your competition nutrition change, either before or during races? That was a major change! At CIM two weeks ago I tried Maurten’s 320. Remarkable stuff! Instead of feeling queasy during a race after consuming about 250 calories of liquid nutrition, I was able to drink 640 calories of Maurten’s with absolutely no GI issues. Shoes – those Nike 4% are the real deal! Splits – I try for even effort the entire way, which would be even splits on a flat course.